Happy New Year! Danube have been working really hard already this term! We have enjoyed talking about, and reading our class novel ‘The Iron man’ by Ted Hughes. We have read the first chapter already and have been developing out reading strategies by asking questions, making connections, visualising and re-telling the key points in the text. We have also started the first draft of our art work - look out for the finished product. We had over 50 entries this year for our Christmas competition. We took Paddington to the library to see an exhibition of Nick Sharratt’s illustrations. Look at our fabulous cats in the style of Laurel Burch. We loved the bright colours and simple shapes of Laurel's cats and so decided to draw some of our own. We drew the outline a bit at a time using black felt tips and then chose a pattern to draw inside them. Some of us chose circles, some chose triangles, zigzags and even flowers. We filled them in using pastels to create a vibrant look. What a great job we did! Pupils in Year 6 use the computer to product portraits of Dracula in the style of George Seurat - Pointllism. Following our farm trip we looked at Marion Boddy-Evans' amazing sheep paintings and tried our own. 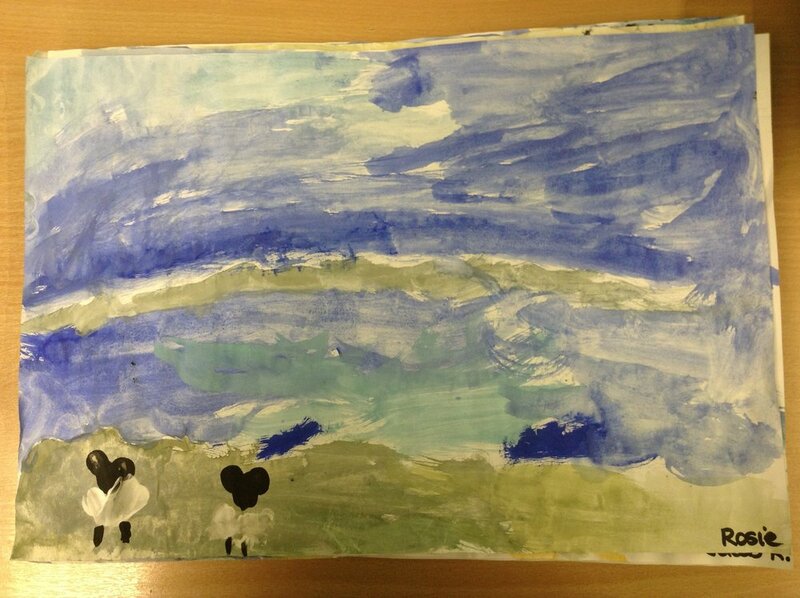 We colour-mixed shades of blue and green for the water, land and sky and then finger painted our sheep on top. What a great job we did! We tweeted examples of our work to Marion Boddy-Evans @painter and she tweeted straight back! She really liked our work and said that we had 'made her day!' Wonderful to have recognition from a 'real' artist recognising Early Years' artists! Inspired by the work of Georges Seurat we worked hard to create our own digital images. For our learning log homework this week we have made storybox settings for our class novel The Jungle Book. They are fantastic and we are using them in class to help us with our writing. Well done to everyone who made a special effort with these they are amazing! Diwali is a Hindu festival of light. Find out all we learnt about this special celebration. Year 4 have been sketching and painting. This week we have read 'Funnybones' by Janet and John Ahlberg and created skeletons in various ways.